News: Urwerk UR-111C. An Unconventional Timepiece with Optical Fiber in two 25-Piece Limited Editions. Urwerk’s departures from its signature theme of wandering-hour indications have always been spectacular and the new just released Urwerk UR-111C is no exception. This latest exercise in complex micro-mechanics is a worthy rival to the brand’s other "Special Projects" line, in both originality and mechanical virtuosity. In the Urwerk tradition, none of the indications of this UR-111C watch are conventional: The minutes are shown in two different ways —linearly for eyes pleasure and digitally for precision. Never has a roller on the case performed the functions of the crown, nor have the running seconds meandered across a cluster of optical fibers. Nor would it be an authentic Urwerk watch if its case didn’t look as if it had been designed by a Sci-fi passionate. The case on the new Urwerk UR-111C measures 42 mm wide x 46 mm long and 15 mm in thickness. Then these two had to turn their intention into reality and create a new interface with the watch. So instead of the conventional crown at the end of the stem, they conceived a roller integrated into the top of the case above and parallel to the winding stem. Rolling the long fluted cylinder with your thumb to wind the watch is indeed a new sensation, but making it possible requires miniature gearing, complex articulations and intermediate wheels to connect the controls to the winding stem. The same applies to the original way of setting the time. Instead of pulling out a crown you swing out a lever from the side of the case and turn the roller in either direction. Of course, the linear display of minutes has been done before by Urwerk in the CC1 King Cobra watch, but Martin Frei decided to set an extra challenge to Urwerk’s construction engineers for the UR-111C. The UR-111C’s digital seconds are mounted alternately on two tiny wheels: 10, 20, 30, 40, 50 and 60 on one wheel, and 5, 15, 25, 35, 45 and 55 on the other. Each openwork seconds wheel weighs 0.018 grams —0.025g with numerals miniature lacework in metal— thanks to the LIGA process. The seconds numerals look strangely close as they pass across a circular window in sinuous progression. They appear alternately, transported into visual range by a dense cluster of precisely aligned optical fibers, known as an image conduit, positioned a tenth of a millimeter above the numerals. This is a world première in the watchmaking industry. The final touch of complexity in an already complex machine is its case. The 37-jewel automatic movement with its unique indications provides a power reserve of 48 hours when fully wound. Additionally, due to its transmission systems and selfwinding gear, it have to be slotted from the side of the case, once the panels have been removed and the time-setting lever dismantled. This is a slow and delicate operation given the tiny clearances and fragile mechanisms. The new Urwerk UR-111C is available in two 25-piece limited editions, one in polished steel and the other in a gunmetal finish. Sticker Price CHF 130,000 Swiss Francs —approximately $130,000 USD— for either version. For more info on Urwerk click here. 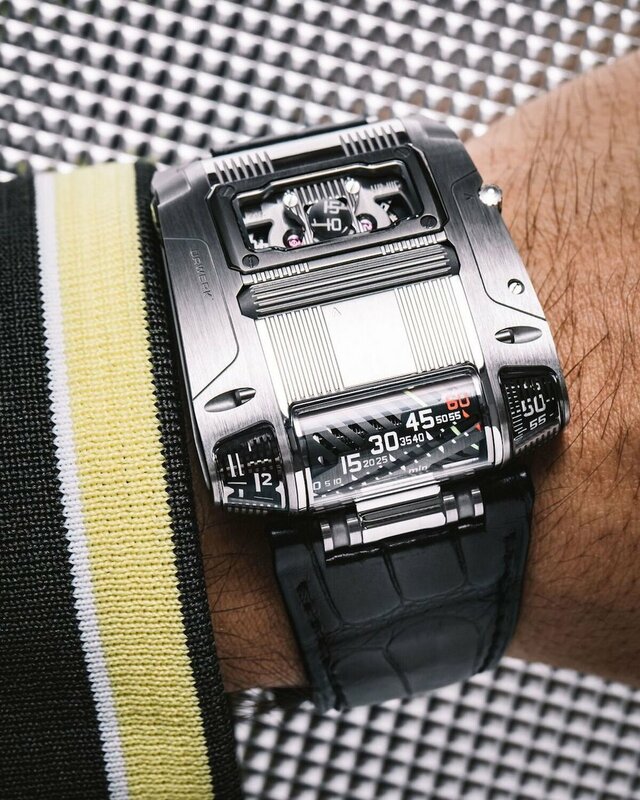 Posted on September 12, 2018 by Editor & Publisher and filed under Urwerk, News and tagged Independent Brands Urwerk Urwerk UR-111C 2018 Limited Edition Watches Most Popular.